We are very sad to say that Armani recently passed away. His legacy will live on in the 81 incredible registered offspring that he produced. 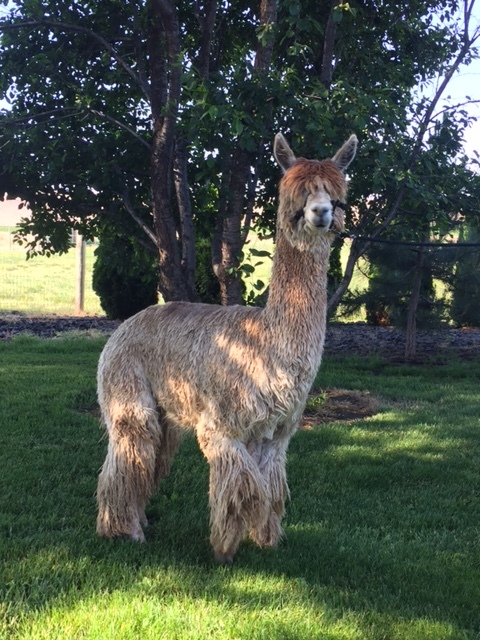 We are so honored to have his genetic running deep in our Seed Stock Suri herd. 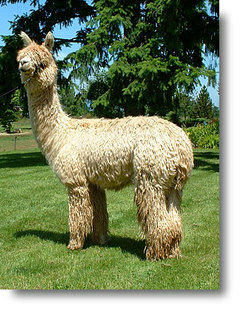 Three of his four ancestors were imported directly from the Accoyo Ranch in Peru. Three out of four were fawn. 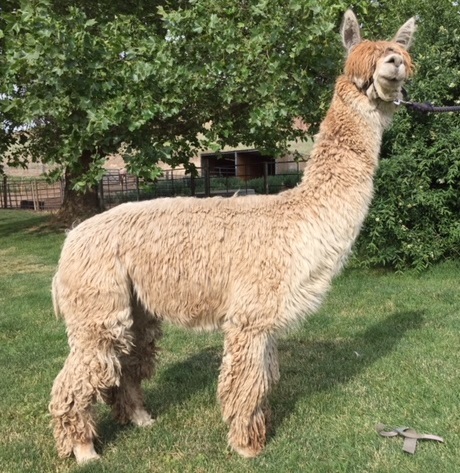 His Dam, Eleuteria, is winning suri fleece awards at 14 years of age while still carrying baby fine fleece. 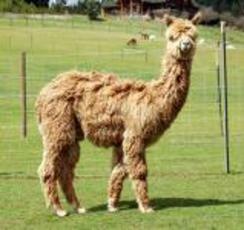 Armani himself still possesses a superfine, extremely bright fleece at six years of age. His 2011 Histogram is back and WOW.. STILL 25.6 AFD at 10 YEARS OLD.. Dang thas good!! This beautiful, 3/4 Accoyo, fawn female is a producer of medium fawn offspring. Aphrodite has exemplary fiber stats with her strong points across the board in Lock, fineness, handle & density. At age 2, she had a classification score of 4.33 and superior fiber stats of (AFD: 18.5, SD:4.4, CV:16.3). BUY NOW AND GET 3 COMPLIMENTARY BREEDINGS TO ANY WHOLLY OWNED SSSAR MALES! BIOPSY - S.H.I.P. CLASSIFIED - EPD SCORES - FROM COLOR CHAMPION PRODUCING SIRE, LEGENDARY DDF ARMANI AND DAM, APHRODITE WHOM HAS PRODUCED COLOR CHAMPIONS. A large framed Male with outstanding substance and conformation to add correctness, style and color to any herd. Eros exhibits natural upright presence. This young male comes from a top champion producing suri stud, Armani a legendary, Champion Producing male who is now deceased. His Dam Aphrodite produced Dior's Casual Man, one of our top CC, up and coming males. Aphrodite is now owned by Sue King. EXCELLENT ADDITION TO ANY SEED STOCK HERD TO PRODUCE VIGOROUS OFFSPRING WITH, DENSE. LUSTEROUS FIBER. Classification overall score of 4.23 was achieved with perfect 5's for FINENESS and 4's for SMOOTH HANDLE. Only shown one time, EROS's 4th place in the Northwest Alpaca Showcase was earned in "the TOUGHEST CLASS of the DAY" QUOTE from the JUDGE. 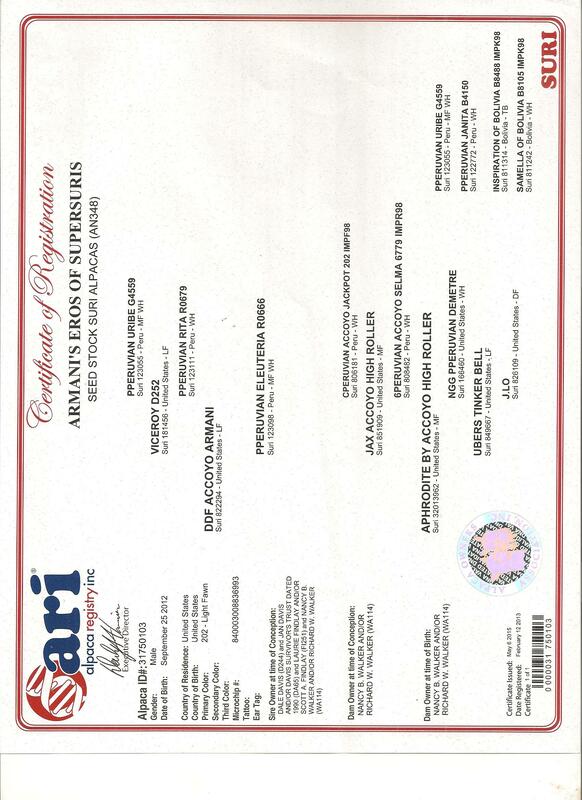 This was indicative of the quality of both Fiber and correct Conformation. A 2015 skin biopsy showed "his true density is 56.8 follicles SQ MM and his S/P Ratio is 12.1/1..15.1 m. variation & Level 4 of 4 gland presence and 50% of his secondary fibers are medulated. Note that a large percentage of his fibers are round which associates with excellent luster. Dr. Evan's says that he has derived secondary fibers that are still maturing so he may show added density in another year. In our 2013 S.H.I.P. Classification, Eros scored a perfect 5 for fineness of micron and perfect 5's all across for Profile, Balance, Substance, movement, phenotype and Testicles. 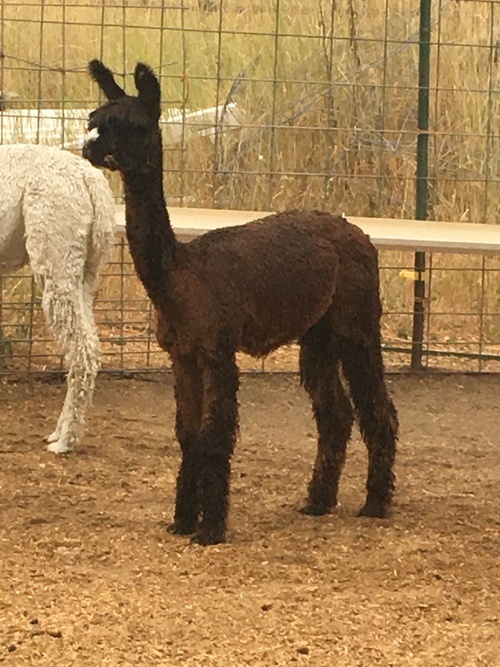 His first cria is a female, Zeva, owned by Loving Life Alpacas and she is Bay Black, showing his ability to produce deep color. His sire, Armani produced over 80 offspring in many colors. Eros has data that is superior to his sire, indicating that he is a stud for the future. This is a rare opportunity to own a stud with TOP GENETICS and the DATA to back up his ability to improve your suri herd.